This is not new news, and I already wrote about this earlier on this blog, but it is worth noting it again: college debt is a factor in postponing homeownership and a lot of other life decisions. I just read this article from RISMedia, written by Suzanne De Vita (online news editor) which reiterates with fresh figures this pressing problem facing our youngest generation. The National Association of Realtors is actively supporting efforts to find solutions and educate students as they take on new debt. 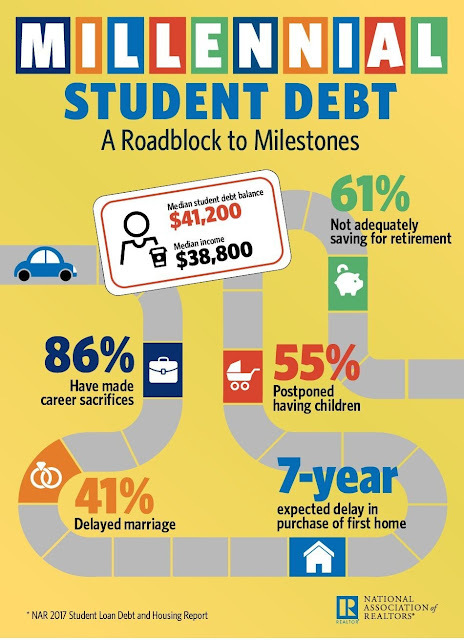 See the following NAR report on student debt. As a result a majority of millenials are postponing several significant aspects of their life, such as marriage, starting a family, or starting any retirement savings. Do you think getting a loan for your education should be more expensive than getting a loan for a car or a house?